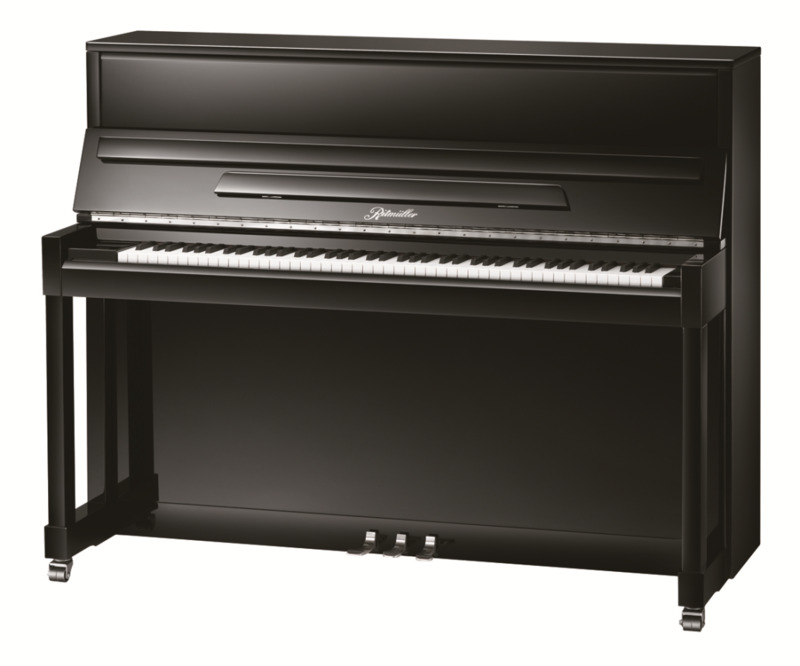 Ritmüller UH118R is the entry-level instrument to the Ritmüller ‘Premium’ series of uprights and grands which extends to a full-size concert grand piano. Pianos in the ‘Premium’ series feature high-quality materials and are crafted to an industry-leading standard. The Ritmüller ‘Premium’ is rapidly gaining a reputation worldwide for quality, performance and value for money. It has received rave reviews in the US press, along with buyer-guide comparisons ranking Ritmüller alongside leading German and Japanese manufacturers. Designed by European master piano makers, the key specifications include a solid mountain-spruce soundboard, German Renner hammer-heads, ebony wood sharps, vertically laminated maple bridges with solid maple caps, and a precision action featuring select hornbeam and maple wood. All are housed within a world-class cabinet using top-quality materials and chrome fittings. Ritmüller pianos date from Germany in 1795 and today are made by the world’s largest piano-maker, Pearl River. Established for over 60 years, Pearl River is renowned worldwide as China’s leading pioneer for acoustic and digital piano quality, production technology and value for money, and is the only Government-appointed ‘National Technology Centre of Enterprise’ in the music industry. European piano masters, along with the research and development team of the Pearl River Piano Group, continue the tradition of Ritmüller excellence and innovation. Traditional craftsmanship and state-of-the-art computerized manufacturing techniques ensure a blend of technical superiority and artistic excellence admired by players of all abilities. The Ritmüller ‘Premium’ upright comes from China’s leading manufacturer.